CHANTILLY, VA. — Former Steelers great, Jerome Bettis will appear on July 11, 2015 from 9a.m.-5p.m for an autograph signing at the CSA Show located at 4320 Chantilly Shopping Center Chantilly, VA. Show hours and schedule for the entire weekend are: Friday July 10th from 2 p.m.-8 p.m., Saturday July 11th from 9a.m.-5p.m. and Sunday July 12th 1from 0am.-4 p.m. Cost: Friday Admission FREE, Saturday $8, Sunday $8 Weekend Pass $15. Mini items are mini helmets or mini basketballs. Premium items are Full size Helmets, Balls, Bats or Jersey’s. Inscription Tickets must be Accompanied by an Autograph Ticket Purchase. Guests will NOT add an Inscription to a Previously Signed item. BB’s are Baseballs and are considered a small flat. Hockey Pucks are considered a small flat. Art work is usually a Premium unless otherwise noted. Baseball Equipment usually falls under the Large Flat category. Photo Op’s are taken by a professional photographer. Up to 5 people can be in the photo. Pictures are color glossy 8×10’s printed twenty minutes after they are taken. Photo op service provided by Great American Photo. 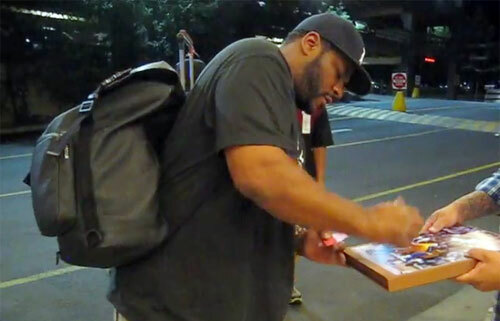 Watch Jerome Bettis speaking about his NFL career in 2012. Jerome Bettis, nicknamed “The Bus,” is a former NFL halfback who played for the St. Louis Rams and Pittsburgh Steelers. Bettis is sixth on the list of NFL rushing yards leaders. He retired in 2006 after the Steelers won Super Bowl XL in his native Detroit, Michigan. Asked about the possibility of retirement, Bettis announced, “It’s been an incredible ride. I played this game to win a championship. I’m a champion, and I think the Bus’s last stop is here in Detroit.” Thus, Jerome Bettis officially announced his retirement standing on the champions’ podium, holding the Vince Lombardi Trophy. Hines Ward, the MVP of the game, said during the Super Bowl commercial, “I’m going to Disney World and I’m taking The Bus!” He is a commentator for the NFL Network and a former NBC studio analyst for Football Night in America. Playing Field Promotions is a booking agent for motivational sports speakers and celebrities. If you would like to book football speakers or NFL stars like Jerome Bettis for a speaking engagement, personal appearance or special event, you can request Jerome Bettis agent and speaker information from PFP Sports & Celebrity Talent or call 800.966.1380.